The award-winning, Singapore-based BreadTalk company has been baking tasty treats for over eleven years. It operates a chain of retail outlets selling a wide range of bread, cakes, buns and pastries. They currently have branches in Indonesia, China, Malaysia, Philippines, Kuwait, Oman, India, Hong Kong, Thailand, South Korea, Vietnam, Bahrain and Saudi Arabia. 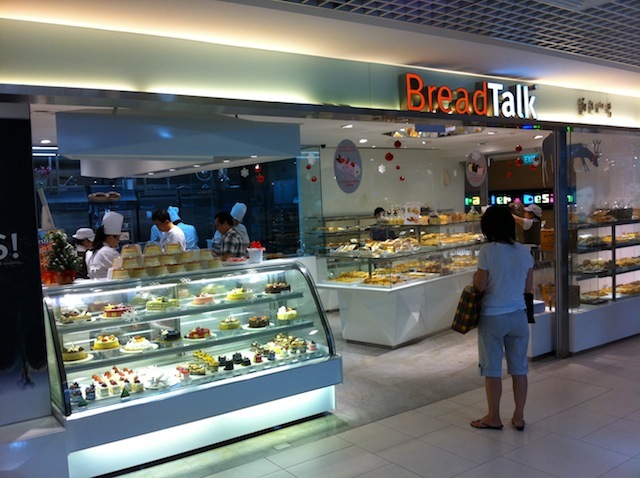 They also have approximately 30 BreadTalk locations all around Singapore. It’s hard to miss the brightly lit store, or it’s heavenly aroma of baked goods. Their signature ‘see thru’ kitchens allow pastry chefs to showcase their expertise right in front of your eyes. The staff is always courteous, prompt, and dressed in white chef hats, uniforms, and gloves. Similar to other bakeries in the region, you grab a tray and tongs and choose any baked good in the display cases. Bring your items to the counter and the staff will ring up your pastries and box them up nicely for you. We visited BreadTalk’s Parkway Parade location (80 Marine Parade Road) on Singapore’s East Coast a few times while we were staying at our good friends’ lovely Mandarin Gardens home. My mouth is watering and I think I’m having Singapore withdrawals while typing this post! If you’ve never heard of pork floss before, it’s a sweet dried pork meat product that has a light and fluffy texture, similar to coarse cotton – and quite pillowy like cotton candy. BreadTalk’s pork floss is stuck to the bun by a delectable, buttery secret recipe cream. Their incredible pork floss bun is a definite must try when visiting Singapore. Check out the following video of buns being “flossed”–it’s simply amazing! For a location near you, click to visit the BreadTalk website here.